I bought cherries. For the first time in ages. (Ever? No, just ages.) I wanted to make a pretty dessert, maybe combine them with pork, but eventually I just ate them directly from the bag. These are probably from Spain, but for me they evoke images of the Eastern Free State: golden sunlight, poplars, hanging dust and low hills separating the mountains from the plains. People with hats, ponies and gum boots. I've never been to Ficksburg, so I conflate images of Harrismith and Clarens, with a spray of blossoming cherry trees thrown in. I know blossoms and fruit are different, but when I think of a cherry tree, I think of blossoms. 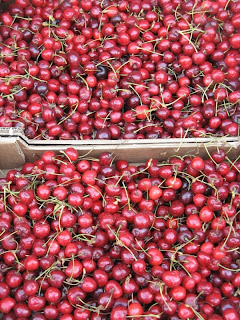 In the meantime, the cherries are dimply: some hurt from travelling, some from living on a tree. It just makes them more real. When I was a child, I always wondered what an apple-sized cherry would be like. Same intensity, clarity and texture, just larger. Now I'm happy with the size, but I still need more.